use on machinery requiring Weldon Fitment and with adapter machinery with Nitto Fitment. multiple cutting edges cutting tool used to make/drill holes in ferrous and non-ferrous metals. An annular cutter cuts only an annular groove at the periphery of the hole and leaves a solid core or slug at the hole center. 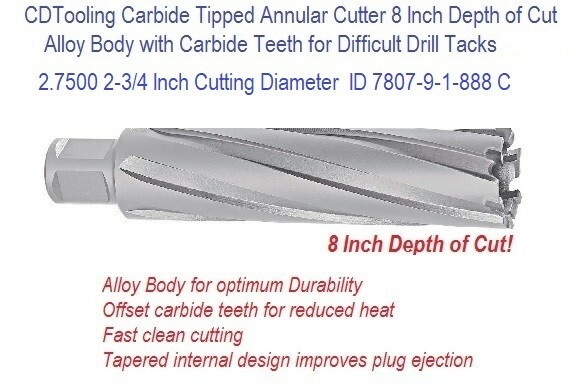 Annular cutter is a substitute for slower, more expensive and less efficient Twist drills and Hole saws. The function of Annular Cutters is more or less same as a hole saw but differs in geometry and material. Annular cutters are faster, easier and are more accurate than the conventional twist drills or drill bits. An annular cutter or core drill removes the material from the metal to create cylindrical holes in a circular cross section. An annular cutter, unlike drill bits, cuts only on the periphery of the hole to be made. Annular cutters use almost the same method as concrete core drills, but are for metal drilling.